Chili with chocolate in it is one of those things that sounds so wrong, it just has to be right. The first time I heard about Cincinnati chili, I thought it sounded gross. Chili with cocoa powder? And spaghetti?! But then I realized that mole sauce has some of the same flavors as Cincinnati chili and I love that, so maybe these crafty Ohioans were onto something after all. We used to live near a restaurant that sold vegan Cincinnati chili and it was always something that we meant to try, but never got around to doing. And then the restaurant closed. I was disappointed, but then I kind of forgot about it until I saw a recipe for Cincinnati chili on There’s Always Thyme To Cook. Suddenly, I remembered that restaurant and how I still haven’t ever tried Cincinnati chili. I finally resolved to make my own vegan Cincinnati chili recipe. Anyway! Obviously soy crumbles are out of the question, so I decided to use lentils instead. I was a little bit nervous that they’d fall apart while cooking as lentils sometimes do, but they stayed intact. And wow, I wish I had started making this vegan Cincinnati chili recipe years ago–the spices and addition of cocoa powder make the sauce reminiscent of mole. It’s like mole with slightly less assertive flavors, I guess. And lentils, well, lentils are good in everything, right? They’re also way (way) cheaper than those frozen soy meat substitutes, making this recipe budget-friendly too. 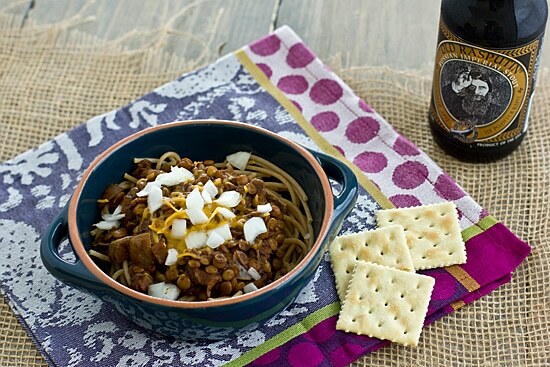 A vegan Cincinnati chili recipe made with lentils. Adapted from There's Always Thyme To Cook's Cincinnati Four-Way Chili. Heat olive oil in a large pot over medium-high heat. Add onion and cook 3 minutes, or until softened, stirring often. Add chili powder through paprika; stir to coat and cook 1 minute. Add vinegar, broth, tomato sauce, and lentils. Bring to boil. Reduce heat to medium-low. Simmer partially covered for 30 minutes (or until lentils are tender), stirring frequently. Serve over whole wheat spaghetti and garnish with onion, cheese, and crackers. As an Ohio native, I can totally vouch for the authentic taste of this recipe inspired by the classic dish from “the Queen City”– Cincinnati! As I prepped the spices and smelled them all together, it felt like being home again! Great job recreating his vegan version! I love hearing that this stands up to the original! 🙂 Thanks for your comment! Cincy native here….I’ve made this several times now and it tastes like authentic cincy chili and cures my skyline cravings. I always add another cup of broth to make it a little more soupy other than that a perfect recipe thank you !! I love this recipe! I have been a vegetarian for almost 23 years, but grew up eating Skyline Chili. I have always missed it and decided it was time to find a vegetarian recipe. I totally forgot I had looked at this one a while ago. I tried it this afternoon and I am so glad I did! 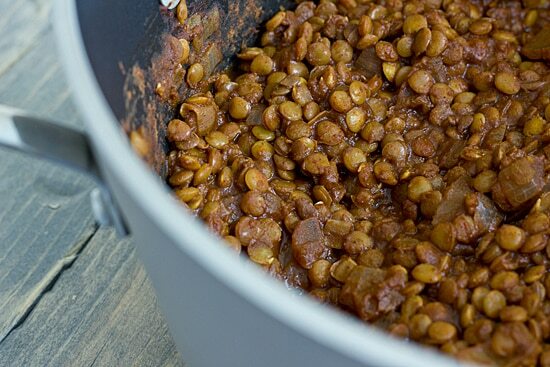 I cooked it in the slow cooker on high for about 4-5 hours until the lentils were soft. I also used four cups of broth and pureed it in my food processor for more of an authentic texture. My husband is a meat eater who loves Skyline too and he actually thought this was pretty good. I have been wishing that Cincinnati chili places would offer a vegan chili that tastes like Cincinnati chili. I found one that does the same day I found this recipe but home cooked food is usually better for us so I gave this a try. We all loved this, it was amazing! I made coneys with it. I used the electric pressure cooker for the chili. Now I just need to get the right mustard and vegan cheese to top it off. Thanks for sharing this excellent recipe. I’m new to pressure cooking, any certain instructions for this method? or just put everything in the cooker at high pressure for 10 min? This came out great! I made a couple of modifications based on what I had: Instead of using only lentils, I used a bag of the beyond meat feisty crumble and only two ounces of lentils. I used brown rice instead of whole wheat spaghetti and cooked it with the rest of the vegetable stock I had rather than just water. Thanks for the inspiration! I just tried this recipe and it came out excellent. I’m originally from Ohio and use to love Skyline Chili. I did make some modifications. Instead of lentils, I used a bag of Gardein meatless crumbles. I omitted the onion and oil in the actual chili part. I doubled all the spices except the bay leaf. I cooked the meatless crumbles, added in the vegetable broth, tomato sauce, vinegar, and spices. Brought it to a boil and simmered for 20 minutes. I topped it over spaghetti noodles and made it a 5-way. Topped it with kidney beans, chopped onions, cheese, oyster crackers and Frank’s Red Hot sauce. It tasted spot on and looked identical. Thanks for the recipe! LIfe-long Cincinnati native who has been Vegetarian for 10 years. This is a wonderful recipe. It taste like what Skyline Chili used to taste before it became so processed and watered down. I love the lentils over using processed fake meats. If Skyline used your recipe I would go back there again. Their veggie chili option cannot compare. I use a rice cooker to make this and it’s ready in no time. Thank you from the very bottom of my heart ? what is the serving size? Calories ? etc???? I am on weight watchers and trying to track my eating. Thank you! just made this (again) but I used a pressure cooker, turned out great! thank you!